Pico de Gallo - A Very Special Salsa! This is a very special salsa because most of the salsas are liquid, while the salsa pico de gallo is of solid consistency. In this salsa you will have a combination of tomato, onion, serrano pepper and coriander . All these ingredients are chopped, seasoned and mixed – which generate a fresh, spicy and delicious flavor. 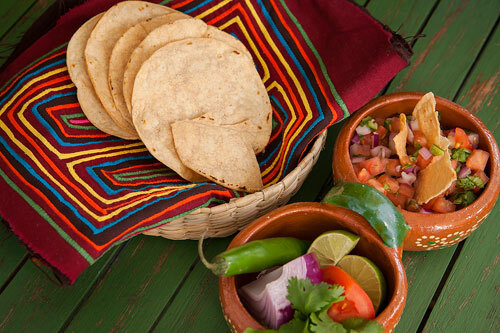 In Mexico is typical to put this salsa to the famous molletes so they don’t taste as dry and to give them more flavor. It is also used in other dishes such as: tacos , nachos, quesadillas , fish , etc. What is very clear is that the salsa pico de gallo (rooster’s beak) forms part of the culinary repertoire of almost any Mexican cuisine , but the origin of its name remains a mystery . It is believed that it was assigned to it because previously this salsa was eaten using the thumb and index finger, resembling the sting action of a rooster’s beak . Others say that it was given because the ingredients’ colors look like the hues of the roosters’ feathers. Another theory indicates that all the ingredients are cut in the same size as the food of a rooster, about one centimeter. But whatever the true origin of the name is, there is no doubt that it is an excellent salsa to put on snacks or to accompany dishes. Making this salsa is very easy you only have to chop and mix ingredients, that’s it. To make the pico de gallo onion is used and you may use white onion or red onion. The red onion will give a point of color to the mixture and the white one will give a more potent flavor – whichever you prefer. This salsa is prepared with 1 serrano pepper, which has a medium hotness. If you want a spicier salsa you can use more chilies or vice versa. The salsa will be ready in 5 minutes . Dice 1/2 onion and 3 tomatoes; upon completion put them in a bowl and reserve. Finely chop 1 serrano pepper and 2 coriander sprigs; then pass them to the bowl. If you want a milder pico de gallo, remove the seeds and the veins of the serrano pepper. Mix very well the pico de gallo with a mixing spatula. * This salsa is also known as “Mexican salsa" because it has the flag colors. Tip: Believe it or not you can also eat this salsa as a salad and it tastes very good. Variation: There’s also the Yucatecan version of this salsa. The bowls tend to be unstable and when you prepare something in the them they move a lot. Well this problem is over with the “Amco Silicone Bowls". The silicone that they have on the base maintains them stable while they are used. If you chop the ingredients on a flexible chopping board it will be easier to transfer them to the bowl. To chop so many ingredients you will need a knife that is sharp, precise and with a comfortable grip like the Victorinox.